I have been reading about the new food trends for this New Year. Everyone has different opinions; some I agree with and some I totally disagree. I decided to offer my analysis of what I see the trends to be. Most of what I see is from what I have gathered over the past years through the website and in communicating with people around the world. First what I see are not new food trends but some of the same ones which I have seen at various times throughout my life. Many periods of time have experienced hard economical times throughout the history of the United States and that of all the other countries. Today we along with most people around the world are experiencing one of these times; probably a more “global problem” than ever before. A basic breakdown of the new food trends that I see around the world come in two parts. First there is a need to be able to provide food for ourselves and to feed our families very economically. Groceries prices are rising at a very fast pace and it is becoming difficult to continually feed our families. Where does it end? We do not know when the prices will stop going up so we need to do everything possible to save as much as possible on food. Second, I see a heavy demand from people to be able to eat healthier. This is not necessarily to lose weight but to keep our bodies healthy so we do not need to visit the doctor as often. I see this problem and the high cost of foods as very interconnected and these two can be remedied with the same changes. One thing, we who eat out in restaurants know that it is much cheaper to eat at home. We can’t blame the restaurant establishments for this. In order to stay in business, they have to make money. They have tremendous overhead. They pay as much for food as we do plus they have to pay employees to prepare it and all the overhead expenses. Common sense lets us know that we can cook at home cheaper than eating out. The other part of the new food trends of wanting to know how to eat healthier can also be helped by eating at home. When you cook yourself you are in control. Eliminating some of the fats and sugar in the recipes makes the food healthier. Cooking fresh vegetables adds to the healthiness of your family’s diet. Sometimes you may have to work with vegetables to get your kid’s “interest” but it is possible when you are in charge. So how do you save on the food you buy? 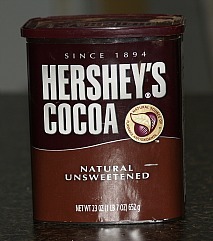 One item several listed on the new food trends is cocoa powder; I totally agree. To me this is not a new trend but one that existed in the past. I have often shared with you that my family could not afford chocolate when I was young but we always had a can of Hershey’s cocoa powder. 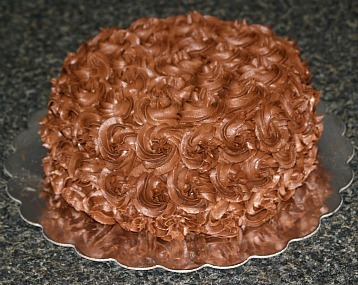 Everyone has always gotten hungry for chocolate; it truly is a “comfort food”. I know there are other brands but I only know Hershey’s. It is much more economical than chocolate, it has an indefinite shelf life and it is so good for chocolate recipes; even ones calling for baking chocolate. NOTE: Cocoa Powder Substitute for Chocolate: Mix 3 tablespoons Hershey’s cocoa powder with 1 tablespoon shortening or oil for 1 ounce unsweetened baking chocolate. 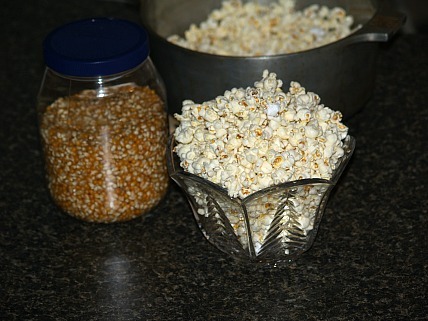 Popcorn is another of the new food trends many added to the list. I totally agree with this; I am talking about the bulk popcorn and not the microwave type. This also is an old trend; one from my younger years before everyone got so prosperous. Buy the bulk and learn how to pop popcorn. It is so much cheaper and the taste is so good. Of course salt and melted butter adds a lot of taste but for a healthier version it still is very good plain. This makes a much better and cheaper snack for the kids than does all those calorie laden snacks with fillers. HOW TO POP POPCORN? I use 5 quart saucepan with lid. Add about 4 tablespoons cooking oil to pan and heat over medium high heat. When the oil is hot (I can tell if hot enough by the ripple of the oil and a slight smoke) add ½ cup good bulk popcorn making sure it is one layer; the fresher the better. I purchase it in bulk from Amish or Mennonite store or similar. Cover the pan with lid and you will hear the popping start. The corn will all pop in only a couple of minutes; when the popping sound slows down, be ready to remove pan from heat with pot holders to heat resistant pad. Two more new food trends I would like to offer to help save you money. First I have practiced for decades of always keeping dry milk powder in my pantry. In many recipes this is just as good as the milk in the jugs. It stores well in your pantry and is so convenient to use. For emergencies, having this prevents making a special trip to the grocery store. Anytime you make a trip to the grocery, it costs money in gas plus most people usually pick up something extra costing more money. Making fewer trips to the store saves money. Vinegar is another product I would not be without. Try mixing vinegar and oil with spices and herbs for salad dressing instead of the expensive commercial salad dressings. This brings out the flavor of the fresh vegetables where the heavy bottled types will mask the flavor and crispness. Vinegar can be used in many recipes, can be used to tenderize cheaper cuts of meat and can also be used in the kitchen for cleaning. A great ingredient offering lots of “bang for the buck”. Preheat oven to 350F degrees; grease and flour 3 round 8 inch cake pans. Cream butter, shortening and sugar in large mixing bowl until light and fluffy. Add eggs and vanilla; beat well. In another bowl combine flour, cocoa, baking soda, baking powder and salt. Add dry mixture to creamed mixture alternating with buttermilk. Blend well and divide batter evenly among the 3 prepared pans. Bake for 30 to 35 minutes or until pick comes out clean. 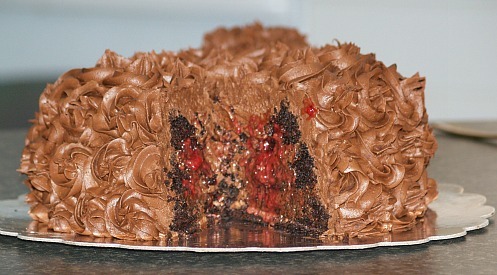 Melt butter over heat; stir in cocoa powder until smooth. Heat about 1 minute until mixture bubbles. Remove from heat and stir in milk until blended. Pour into mixing bowl; add powdered sugar and beat until smooth. Add vanilla and beat until spreading consistency.